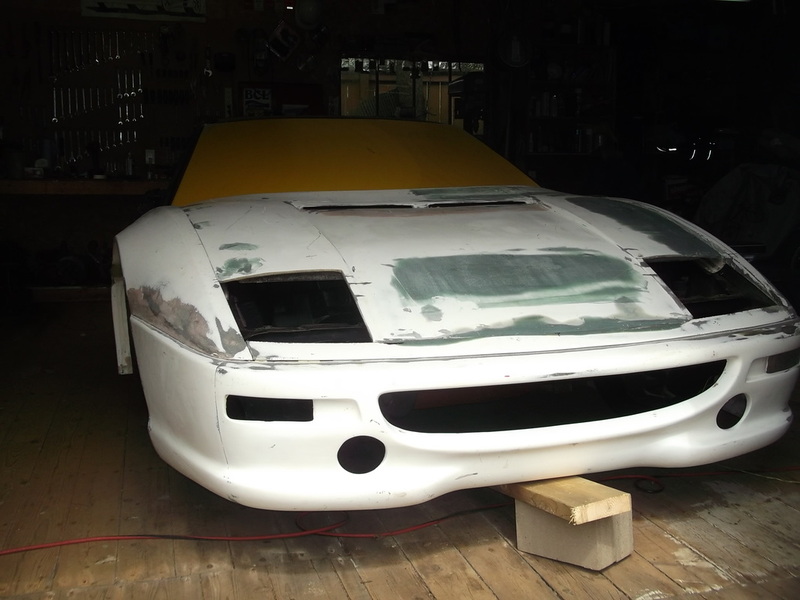 As you may have guessed by now, my plan is to fabricate and fit a Ferrari 355 style body on my project car. 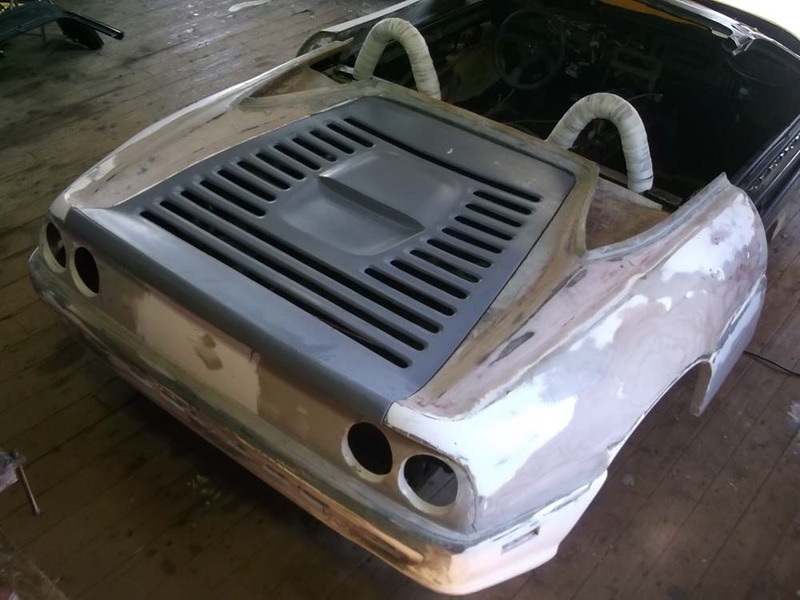 Luckily, my plan to build myself a car body will also involve the efforts of my friend Dave who is also planning to build such a body for his project. Here is a brief overview of how we expect to achieve this goal. 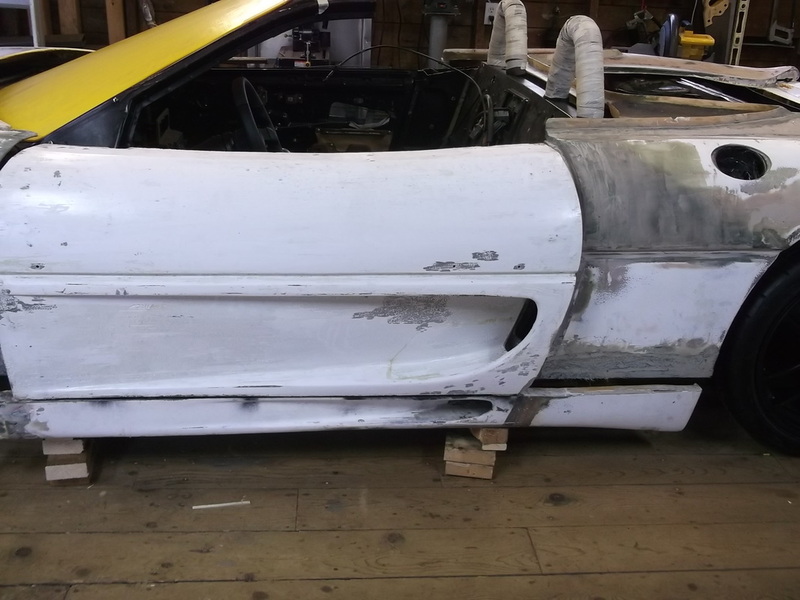 Firstly, you should know that Dave currently has in his possession, two complete 355 body kits including most of the panels and parts needed to cover a Fiero chassis.........or two. The first body is a fibreglass kit that he purchased along with his chassis as a project in progress but needing much TLC. The second body kit was practically donated and dropped in our laps by a friend of ours, Don, from Victoria BC. 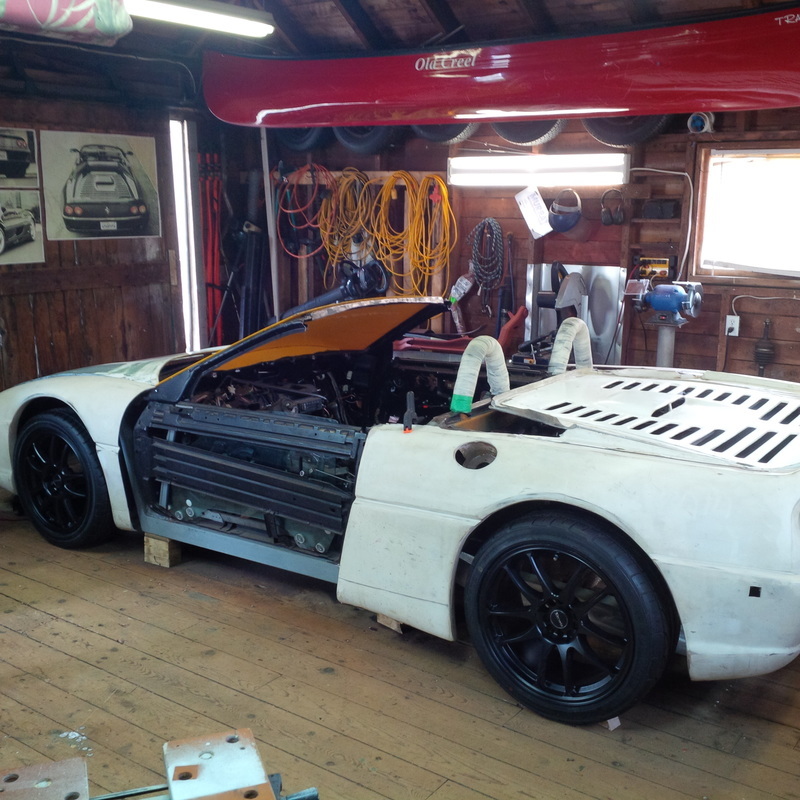 Fortunately for us, Don had begun the long, involved process of getting an fibreglass body kit up to snuff for a Fiero project. Using the best parts from each kit, it is our plan to get one complete, high quality body kit together and then use this body to "splash" a set of female moulds from the panels. From these moulds, we'll each be able to lay-up a set of clean body panels plus any spare parts we wish to stockpile for future use. To add a small twist to this plan, we are considering the possibility of fabricating our body panels from carbon fibre using a vacuum infusion technique to help keep the weight down and maintain a strong smooth structure. For my project, I hope to be able to produce a set of carbon fibre body panels that are high enough quality to forgo an expensive paint job. An alternative plan is to do a selective paint job with peek-a-boo carbon fibre revealed in select locations around the body. Either plan will be very cool to look at when complete. I will certainly be calling on the expertise and experience available at the shipyard that I am currently employed with. 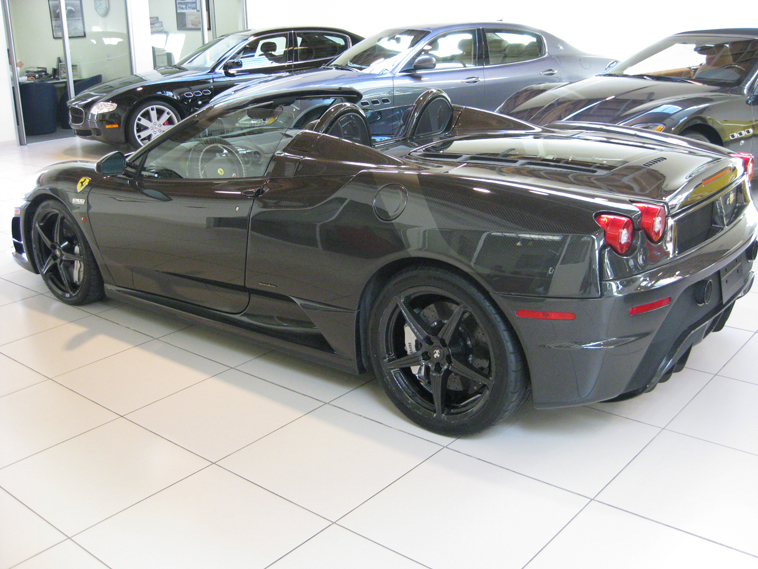 We have been doing fibreglass and carbon fibre work for many years. 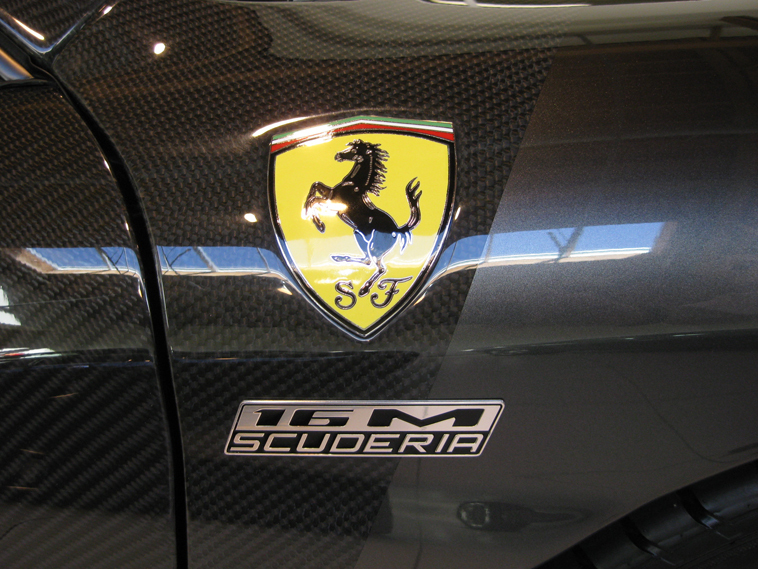 So, here are a few examples of beautiful Ferraris which have been clothed in carbon fibre. The results can be intriguing and eye catching and offer a totally unique feature to our project cars. At this point in my project, I am a long way from building the finished body panels for my car. 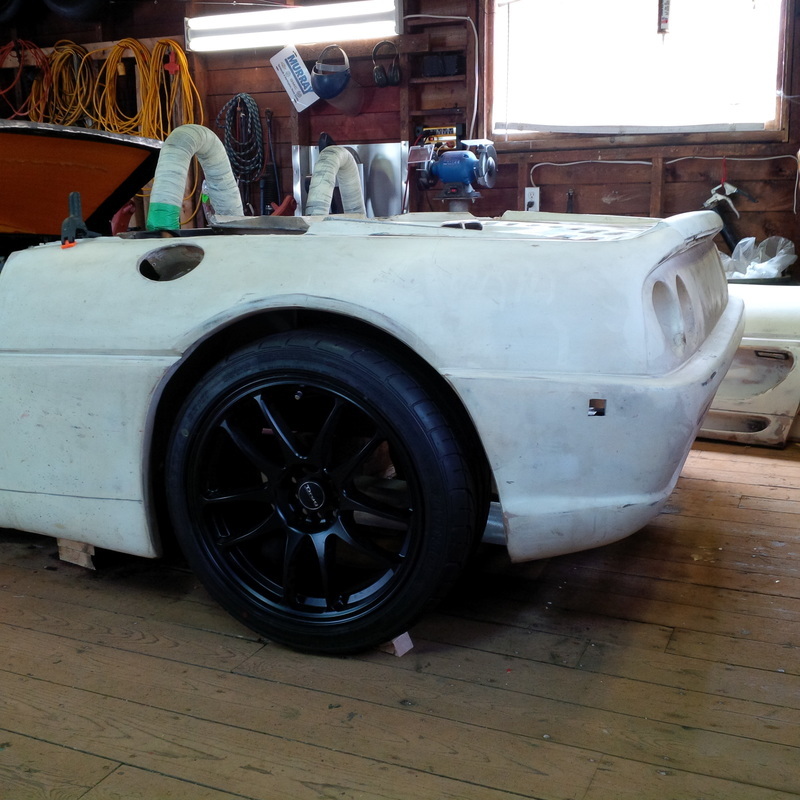 However, I am fortunate to be able to use one of the fibreglass body panels that I mentioned above. Keep in mind that the glass is still a long way from finished, however, it does provide an glimpse of what is to come as well as help me visualize what changes are still required to my chassis to accommodate the 355 body panels. Here are a few pictures with the front and rear panels in place. It is quite shocking just how low and wide this car is going to be when its done. Wow, it's been over 5 years since I first started discussing plans for the 355 body. Since that original post in July 2013, the project has certainly progressed on many fronts and as is often the case with projects like this, there are many changes made along the way. This is particularly true with regard to the body. While my plan to build a car with a Ferrari 355 style body is still my goal, there have been some major decisions made that are going to have significant impact on the style and look of the project car. If you have been following along, you will have noticed that in the Chassis section, there was a new subsection added in October 2017 called '6" Stretch'. This new development was driven by the fact that my longitudinal engine drive line was going to require a longer chassis. While I always knew this would be a possibility, I did spend a significant amount of time and effort trying to resolve this issue without further modification to the chassis. However, in the end, I came to the realization that I could not avoid further increasing the chassis wheelbase by 6 inches. While this decision did solve many issues I was having with the drive line, it did in fact create a new set of problems that would need to be addressed; primarily, my Ferrari 355 would stretch from a wheelbase of 96.4 inches to 102.4 inches. I did consider trying to hide some of the extended length in the area behind the rear wheels, however, I felt this would create a significant departure from the overall look of the 355 body. With this decision firmly planted in my brain, it was time to start taking a serious look the 355 body. My first step was to find a suitable 3D model that was relatively accurate in scale and detail and would work with my modelling program. I purchased a computer model of a Ferrari 355 that was available in a file format that could be converted to a format I could use. It is quite detailed and appears to be accurate enough for my purpose and it even has the interior modeled. Here are a few images with the glass turned on and off. As you can see, the model is a coupe as opposed to a spyder like I am building so that is one of the first modifications I will make to the model. Once I imported the body model into my 3D chassis model, I realized that my drawing file was now over a Gig, causing some memory grief for my laptop, especially when rendering the drawing. I decided to cut the body model in half and delete one half of the drawing. This would make sense to do anyhow as I will be modifying one side and mirroring the drawing to make the full car body. I also removed the interior portion of the 355 model for now as its will only be a distraction at this stage of the project. I must say I was pleasantly surprised when the body model was imported and positioned on my chassis model. It was nice to see that none of my chassis modifications and additions were protruding through the side of the body :) At this point, I just did a quick butcher job on the drawing to remove the roof and rear pillars. I also sliced the body just behind the door and added a 6 inch filler piece. Here is how the body looks on my chassis drawing. You will notice that the original model of the body was a polygon format which I converted to a NURBS model and in the process, sacrificed some of the body precision to keep the drawing size to a manageable level. The yellow color highlights this fact. When the time comes to start building the body, I will reintroduce the higher level of precision to the body model. Here is what the body model looks like when its not rendered.